» 2012 » August Why Outrun The Bear? [wprunkeeper activity=”106732256″] Although it now seems a while ago, last Thursday was the 2012 Dublin Irish Festival 5k race. I had been looking forward to running this race since I started running last year. I had only been running about 5 days when the event came round and there was no way I would have been able to complete a 5k race this time last year. In fact looking at the stats from last year, I was running just over 2 miles including the warm up and cool down but at least I was running. The big reason I wanted to do this race is that it goes right past my front door. In previous years it has been frustrating to have the race go past my door as it meant it would be hard to get home if I was out in the evening (and I was invariably trying to get home after doing projection or sound at church) and I can remember at least one occasion that I had some takeaway gyros getting cold and I couldn’t get near the house. This year I was looking forward to running the race. Unfortunately I did something to my left leg over a week previously and I had not run for a week so I was a bit nervous to see how my leg would hold up, but walking around during the week I had no problems. Thursday after work I came home and hastily put together a sign for the front garden, got changed into my running gear and then headed to the mailbox to stash a frozen bottle of water to grab on my way past. I headed down the road and stopped off to say hi to the neighbours who were manning the first water stop. They were putting the signs and banners up as I left them with instructions to cheer me on as I came through and then I started to run to the start. I tried to keep the pace slow as it was hot, slightly uphill and I didn’t want to tire myself out. My leg didn’t start to give me any trouble until about half way and as I was early to the start I then headed up the road to Kroger to get some ibuprofen and washed some down before the race started. The race is put on by the Columbus Running Company – my running group, so as usual it was nice to see some familiar faces and hang out before the race started. There were loads of people there, most of whom were wearing the race tshirt as there was a garmin giveaway after the race and you had to be wearing the sponsored tshirt. Due to my leg hurting I lined up with Chase who was the 1030 pacer but had intentions of hoping to do better than that if possible. The race started and the first part was all downhill, very congested and felt slow. It was really funny to hear everyone groan as they turned right and saw the hill. Normally I hate this hill as it is at the end of my run, so I am hot, tired and have to face this hill to get back into the neighbourhood. It took me ages before I could run up it without stopping but today I smiled at the groans from the other runners and pushed myself up the hill, powering up and overtaking tons of people and felt really good. IMy pace actually increased to sub 9 minute mile as I went up the hill. At this point my legs seemed to have eased up and I enjoyed the run through the neighbourhood with tons of spectators. Not to worry, I headed down to the bottom of the hill and turned right back up another hill (or few). I was pleased to see that the leaders had not yet made their way back so it felt good knowing that I was making a reasonable pace. About 1.3 miles into the race as we were going up another incline we saw the leaders heading back down the race and cheered them on and then it was our turn to head right and towards the turn around point. At this point, MothAudio on RunnersWorld describes it in his race report very well – “The road is rising, the sun is in our face and the devil in screaming in my head. All I can do is look straight ahead for the lead runners knowing the turn around can’t be much further.” Rings Road seemed very long and very slow and even the water stop half way down on the return journey took forever to get to. The way back was tough but seeing other runners from the Thursday night Turtles group and getting cheers from them helped me to keep going. I was surprised to see we got a medal for this race – so this joins my half marathon medal around the cats neck and I grabbed a banana and water to cool down and went to look for other runners. About 3 minutes later my left leg was screaming and it hurt to walk up an incline, let alone up the kerb at the side of the road. Standing still it was ok and I had to move slowly with a bit of a limp but I still had the runners high (which was probably just as well). We hung around for the finishing ceremony and I was 11 away from winning the new gps and then had a very long, slow walk home. Even the cops asked if I was ok as I walked home and laughed with me as I said I had probably overdone it but still enjoyed it. As I walked back up the hill again towards the water stop, I joined the neighbours who were having a party afterwards. It was good to hang out with them for a while and grab a burger. Getting up after the rest was painful though and I hobbled back home. Friday morning was not fun. My leg had totally tightened up overnight and it took me about 5 minutes to get to the bathroom in the morning – really not how you want to start your day as I shuffled around at about 4” per step. I eventually got to the other side of the house and grabbed my crutches which made it a lot easier to get around and I ended up using them all day Friday. As it didn’t seem to be getting better and this is the second time in a fortnight that this has happened, I’ve made a Dr’s appointment for Tuesday. Saturday I needed one crutch for half the day and then the evening and Sunday I’ve been moving around the house slowly without any crutch. The leg is feeling a bit tight but better so I’m currently wearing my compression socks to see if that helps. I totally had to miss out on the Irish Festival events – crutching around a festival n 95 degree weather would not have been much fun, so I’ve taken the opportunity to just relax and catch up with some of the running blogs and finally getting around to writing this runcap. 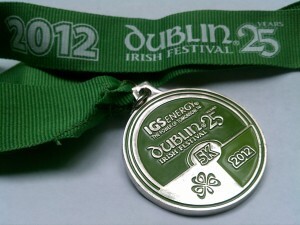 Anyone else run the Dublin Irish Festival 5k run? What did you think – did you write a recap? Do you write recaps for 5k runs? Anyone ever checked their mailbox in a run or had a race go right past their front door?